Lightning Dock KGRA, located on the east side of Animas Valley in Hidalgo county, New Mexico, was designated a Known Geothermal Resource Area (KGRA) on Februrary 1st, 1974 '"`UNIQ--ref-00000006-QINU`"'. The geothermal anomaly was identified almost twenty years earlier, in 1956 by Kintzinger'"`UNIQ--ref-00000007-QINU`"', when four agricultural wells that had been drilled in 1948 were examined '"`UNIQ--ref-00000008-QINU`"''"`UNIQ--ref-00000009-QINU`"'. These wells had encountered 101.5°C water at depths less than thirty meters '"`UNIQ--ref-0000000A-QINU`"'. The geothermal resource at Lightning Dock is considered a blind resource and is an intermediate to high temperature resource '"`UNIQ--ref-0000000B-QINU`"''"`UNIQ--ref-0000000C-QINU`"'. The resource has been used commercially since 1977 but only recently has power production been successful '"`UNIQ--ref-0000000D-QINU`"''"`UNIQ--ref-0000000E-QINU`"'. The low mean annual rainfall of approximately 10.83 inches limits the availability of cooling water while the high mean annual temperatures of 78.4°F in summer and 43.1°F in winter make water cooling a necessity '"`UNIQ--ref-0000000F-QINU`"'. Figure 1 -- Extent of Lightning Dock KGRA in the Animas Valley (modified from Smith, 1978) '"`UNIQ--ref-00000010-QINU`"'. A total of eight power plants have been installed at the Lightning Dock KGRA. The Burgett greenhouse has been in operation since 1977, using the geothermal waters of Lightning Dock in a Direct Use capacity. The first attempt at power production was in 1982, when Burgett installed a 40 kW and a 100 kW plant, both designed by Wally Minto of Florida. These plants failed soon after installation '"`UNIQ--ref-00000011-QINU`"'. In 1995, Burgett tried again using three Ormat Machines: one that could produce 350 kW, and two that could produce 400 kW. These machines ran for a while, but a cooling problem emerged, and they had to be shut down. In 2008, Burgett attempted power production again, and installed two PureCycle model 280 binary plants that produce 500 kW '"`UNIQ--ref-00000012-QINU`"'. A lease to utilize the geothermal resource was obtained by Lightning Dock Geothermal, Inc. in 1986 '"`UNIQ--ref-00000013-QINU`"'. Plans to produce power never came to fruition, however, until the company was purchased by Cyrq Energy. Cyrq planned to have a power plant producing 10 MW by January 2014; however a 4 MW plant was brought online in December of 2013, providing energy to the Public Service Company of New Mexico '"`UNIQ--ref-00000014-QINU`"''"`UNIQ--ref-00000015-QINU`"'. The plant is currently being upgraded, with plans to bring the full 10 MW online in the near future '"`UNIQ--ref-00000016-QINU`"'. Cyrq Energy (2014) '"`UNIQ--ref-00000017-QINU`"' is in the process of evaluating existing wells which Cyrq hopes will provide an additional 6 MW of power to the Public Service Company of New Mexico. In addition, a study by Schochet and Cuniff (2001) '"`UNIQ--ref-00000018-QINU`"' proposed an EGS power plant to service Burgett Greenhouse and Americulture, as well as tying in to the existing power service (CDEC). All of these industries are expanding, and therefore greater power production will be necessary." cannot be used as a page name in this wiki. Lightning Dock KGRA, located on the east side of Animas Valley in Hidalgo county, New Mexico, was designated a Known Geothermal Resource Area (KGRA) on Februrary 1st, 1974 . The geothermal anomaly was identified almost twenty years earlier, in 1956 by Kintzinger, when four agricultural wells that had been drilled in 1948 were examined . These wells had encountered 101.5°C water at depths less than thirty meters . The geothermal resource at Lightning Dock is considered a blind resource and is an intermediate to high temperature resource . The resource has been used commercially since 1977 but only recently has power production been successful . The low mean annual rainfall of approximately 10.83 inches limits the availability of cooling water while the high mean annual temperatures of 78.4°F in summer and 43.1°F in winter make water cooling a necessity . Figure 1 -- Extent of Lightning Dock KGRA in the Animas Valley (modified from Smith, 1978) . A total of eight power plants have been installed at the Lightning Dock KGRA. The Burgett greenhouse has been in operation since 1977, using the geothermal waters of Lightning Dock in a Direct Use capacity. The first attempt at power production was in 1982, when Burgett installed a 40 kW and a 100 kW plant, both designed by Wally Minto of Florida. These plants failed soon after installation . In 1995, Burgett tried again using three Ormat Machines: one that could produce 350 kW, and two that could produce 400 kW. These machines ran for a while, but a cooling problem emerged, and they had to be shut down. In 2008, Burgett attempted power production again, and installed two PureCycle model 280 binary plants that produce 500 kW . A lease to utilize the geothermal resource was obtained by Lightning Dock Geothermal, Inc. in 1986 . Plans to produce power never came to fruition, however, until the company was purchased by Cyrq Energy. Cyrq planned to have a power plant producing 10 MW by January 2014; however a 4 MW plant was brought online in December of 2013, providing energy to the Public Service Company of New Mexico . The plant is currently being upgraded, with plans to bring the full 10 MW online in the near future . Cyrq Energy (2014)  is in the process of evaluating existing wells which Cyrq hopes will provide an additional 6 MW of power to the Public Service Company of New Mexico. In addition, a study by Schochet and Cuniff (2001)  proposed an EGS power plant to service Burgett Greenhouse and Americulture, as well as tying in to the existing power service (CDEC). All of these industries are expanding, and therefore greater power production will be necessary. 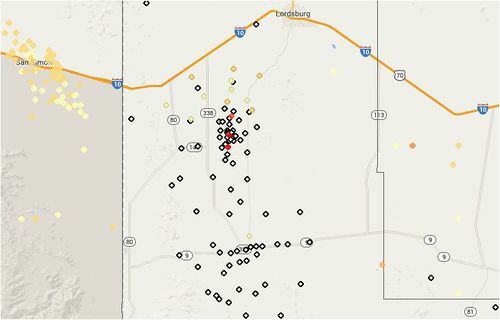 The primary infrastructure in the area of Lightning Dock (Figure 1) is related to the city of Lordsburg. Schochet and Cuniff observed in 2001  that only 20 miles of new transmission lines would be needed to connect Dale Burgett power plant at Lightning Dock to existing high voltage lines when its power production exceeds 4 MW. Cyrq Energy has completed permitting for the new transmission lines . The land surface in and around Lightning Dock is primarily private but the geothermal resources are largely federal and administered by the Bureau of Land Management (BLM), and as such the permits to utilize the resource are currently issued by BLM . The BLM developed the National Energy Policy Implementation Plan in 2001 which has forty-five action items: three of which apply to geothermal energy. As a result of this plan, the BLM has been systematically identifying sites for geothermal leasing, and has cooperated with NREL in choosing ‘Top-Pick’ sites in six states, including New Mexico . In 2003, Cuniff and Bowers  reported that leases had been obtained by Lightning Dock Geothermal, Inc. (LDG). LDG experienced difficulties in permitting: in part because the agencies involved had no experience with geothermal permitting, and in part because permits were required from three separate agencies; the Bureau of Land Management (BLM), the State of New Mexico Oil Conservation Division (NMOCD), and formerly by the State of New Mexico Engineer (NMOSE). Even after land permits have been obtained, Power Purchase Agreements (PPAs) have historically been a problem for geothermal power production start-ups which lead Fleischman to suggest in 2006  that small distributed power stations functioning ‘off grid’ were a feasible solution in New Mexico. Another major concern for regulators in New Mexico is protecting the scarce water resources. Fresh water sources must be protected and consumptive water rights fall under the jurisdiction of the NMOSE for all the land in the State, even federal land . Federal and State level approval are therefore both required, which can lead to major delays if temporary permits from one agency expire while processing permits from the other. The National Environmental Policy Act (NEPA) is another concern for geothermal power companies. As of 2014, Cyrq energy has completed environmental permitting in accordance with NEPA, with a “Finding of No Significant Impact (FONSI)” for all aspects of the Lightning Dock project, including its transmission path to existing utility connections . The first of Cyrq’s power plants was online as of December 2013 and produces 4 Megawatts (MW) of power under a long term PPA, making them the first geothermal company with such agreement in New Mexico. With Cyrq Energy demonstrating that it is possible to meet all the permitting needs and acquire the needed agreements, geothermal growth should accelerate. Cyrq Energy is expanding their power production at Lightning Dock to 10 MW. The 4 MW Dale Burgett Geothermal Plant came online in December of 2013 and the expansion, currently titled Lightning Dock No. 2 (LD#2), is planned as a 6 MW addition. The power is currently, and will continue to be, delivered directly to Public Service Company of New Mexico under a long term Power Purchase Agreement . Americulture, the tilapia aquaculture farm in operation since 1995, completed a DOE cost-share funded study of power production capabilities at the Americulture facility in 2004. The study showed that if they install an electric binary unit to meet their electrical needs they would save 30% on total operating costs while allowing for increasing their fish yields eight-fold . The status of the project is unavailable at the time of writing. "The initial geologic exploration and description of the Lightning Dock area was published in 1918 by Schwennesen'"`UNIQ--ref-00000025-QINU`"'. Although Schwennesen did not identify geothermal resources, a lot of the volcanics currently associated with the thermal anomaly were discussed in his report. Thirty years later, in 1948, boiling water was encountered at a depth of only 26.5 meters when wells were being drilled for agricultural purposes '"`UNIQ--ref-00000026-QINU`"'. These wells are the first known encounter with the blind geothermal resource at Lightning Dock. In 1956, Kintzinger '"`UNIQ--ref-00000027-QINU`"' reported on the first geothermal study in the Lightning Dock area, which was conducted in response to boiling water and steam emanating from numerous shallow wells in the area, including those drilled in 1948. The preliminary study began in 1954 and was conducted by the New Mexico Institute of Mining and Technology, in which three wells were drilled and found to produce hundreds of gallons of boiling water per minute. Ground temperatures were measured using resistance thermometers, and a thermal anomaly of approximately 12°C at a depth of only one meter was identified. The area of the primary anomaly was delineated based on the thermal measurements as well as vegetation changes and reports from local ranchers of snow melt during winter months '"`UNIQ--ref-00000028-QINU`"'. In 1977, Dellechaie '"`UNIQ--ref-00000029-QINU`"' reported the resource to be an elliptical anomaly with an average depth of less than seventy meters, based on thirty-one observation holes. Elston et al. (1983) '"`UNIQ--ref-0000002A-QINU`"' summarized the geochemistry completed up to the end of 1983, stating that the primary source of ground water recharge in the valley seemed to be winter precipitation in the surrounding mountains. The ground water is present primarily in unconfined aquifers and shallow perched aquifers. The geothermal fluids, on the other hand, seemed to be from older, deeper water sources not matching the chemistry of the young meteoric recharge waters. Elston et al. '"`UNIQ--ref-0000002B-QINU`"' reported that the silica geothermometer work completed by Fournier and Rowe in 1966, Walther and Helgeson in 1977, and the alkali geothermometer work by Fournier et. al. in 1973 and 1979 gave good estimates of the temperature of the source reservoir of the geothermal fluids; as high as 169⁰C '"`UNIQ--ref-0000002C-QINU`"'. In 1976, Swanberg'"`UNIQ--ref-0000002D-QINU`"' reported on detailed magnetic and gravity profiling conducted over a 600 square kilometer area encompassing the Lightning Dock geothermal anomaly. Gravity measurements were made at over 500 locations and resulted in a complete Bouguer anomaly map for the area. Numerous profiles were made comparing the residual magnetics and the gravity anomalies, which resulted in the identification of a dipping dike. These methods did not detect features corresponding to cap rocks, silicification or buried magma chambers '"`UNIQ--ref-0000002E-QINU`"'. In March 1977, the United States Geological Survey (USGS) granted permission to AMAX Exploration, Inc. to drill four temperature gradient wells in the Lightning Dock area '"`UNIQ--ref-0000002F-QINU`"'. AMAX drilled fifty-three shallow temperature gradient wells, four moderate depth wells, and one deep test well; well number 55-7. AMAX well 55-7 is likely the best known well in the region and is 7,001 feet deep. In 1988, Icerman and Parker '"`UNIQ--ref-00000030-QINU`"' reported on the numerous proprietary geothermal studies done in the area, including the AMAX study. The 1986 Lightning Dock Geothermal Inc. acquisition of the lease previously held by AMAX, however, has made their previously proprietary data publically available. The AMAX study also included water chemistry work which confirmed the reservoir temperature estimates of approximately 170⁰C '"`UNIQ--ref-00000031-QINU`"'. Two temperature gradient holes were drilled through lakebed sediments in the eastern half of the KGRA to try and find the boundary of the geothermal resource. Hole TG 56-14 was drilled four kilometers (km) south west of the geothermal anomaly to a depth of 381 meters (m) with a measured gradient of 80°C/km. The depth to the 150⁰C isotherm at the TG 56-14 site was estimated to be 1.2 km. Hole TG 12-7 was drilled one km west of the anomaly to a depth of 305 m and the gradient was determined to be 120°/km. The depth to the 150⁰C isotherm at the TG 12-7 site was estimated to be 760 m '"`UNIQ--ref-00000032-QINU`"'. In addition to the two temperature gradient holes, Cuniff and Bowers reported on fifty line miles of seismic traverses, sixty miles of older vibroseis data, 2,000 line-km of aeromagnetic data, two E-W electrical resistivity profiles and data from 304 gravity stations. Much of this data was collected in 2001 during the Geothermal Resource Evaluation and Definition (GRED) Program administered by DOE-AAO under Cooperative Agreement Number DE-FC07-00AL66977 '"`UNIQ--ref-00000033-QINU`"'. CO2 studies were accomplished by graduate students from New Mexico Tech University to search for surface leakage of CO2 along traces of subsurface faults. The results of the CO2 survey suggested that the thermal plume of the anomaly extends at depth to the south west '"`UNIQ--ref-00000034-QINU`"', '"`UNIQ--ref-00000035-QINU`"'. Thermal Ion Dispersion (TID) is a metals exploration method that was applied to the Lightning Dock area in 2002 to determine if it was a feasible technique for identifying the extent of the thermal anomaly. The results not only delineated the anomaly well, but also showed zonation outward from the hottest area, suggesting fluid flow pathways '"`UNIQ--ref-00000036-QINU`"'. In 2005, Cuniff and Bowers '"`UNIQ--ref-00000037-QINU`"' reported on the rest of the work completed under the GRED program, which ended in 2004. GRED temperature gradient hole TG36-7 was drilled to a depth of 305 meters, but eventually sold to D. Burgett. TG52-7 is a deep test hole completed in November 2003 with a final depth of 770 m. Numerous flow tests and temperature tests were conducted during and after the completion of well TG52-7 and a final BHT of 137⁰C was reported, with slightly higher temperatures at shallower depths. Cyrq Energy completed a magneto-telluric survey in 2010 and a 3-D seismic survey in 2012, but they have not made their results publicly available '"`UNIQ--ref-00000038-QINU`"'." cannot be used as a page name in this wiki. The initial geologic exploration and description of the Lightning Dock area was published in 1918 by Schwennesen. Although Schwennesen did not identify geothermal resources, a lot of the volcanics currently associated with the thermal anomaly were discussed in his report. Thirty years later, in 1948, boiling water was encountered at a depth of only 26.5 meters when wells were being drilled for agricultural purposes . These wells are the first known encounter with the blind geothermal resource at Lightning Dock. In 1956, Kintzinger  reported on the first geothermal study in the Lightning Dock area, which was conducted in response to boiling water and steam emanating from numerous shallow wells in the area, including those drilled in 1948. The preliminary study began in 1954 and was conducted by the New Mexico Institute of Mining and Technology, in which three wells were drilled and found to produce hundreds of gallons of boiling water per minute. Ground temperatures were measured using resistance thermometers, and a thermal anomaly of approximately 12°C at a depth of only one meter was identified. The area of the primary anomaly was delineated based on the thermal measurements as well as vegetation changes and reports from local ranchers of snow melt during winter months . In 1977, Dellechaie  reported the resource to be an elliptical anomaly with an average depth of less than seventy meters, based on thirty-one observation holes. Elston et al. (1983)  summarized the geochemistry completed up to the end of 1983, stating that the primary source of ground water recharge in the valley seemed to be winter precipitation in the surrounding mountains. The ground water is present primarily in unconfined aquifers and shallow perched aquifers. The geothermal fluids, on the other hand, seemed to be from older, deeper water sources not matching the chemistry of the young meteoric recharge waters. Elston et al. reported that the silica geothermometer work completed by Fournier and Rowe in 1966, Walther and Helgeson in 1977, and the alkali geothermometer work by Fournier et. al. in 1973 and 1979 gave good estimates of the temperature of the source reservoir of the geothermal fluids; as high as 169⁰C . In 1976, Swanberg reported on detailed magnetic and gravity profiling conducted over a 600 square kilometer area encompassing the Lightning Dock geothermal anomaly. Gravity measurements were made at over 500 locations and resulted in a complete Bouguer anomaly map for the area. Numerous profiles were made comparing the residual magnetics and the gravity anomalies, which resulted in the identification of a dipping dike. These methods did not detect features corresponding to cap rocks, silicification or buried magma chambers . In March 1977, the United States Geological Survey (USGS) granted permission to AMAX Exploration, Inc. to drill four temperature gradient wells in the Lightning Dock area . AMAX drilled fifty-three shallow temperature gradient wells, four moderate depth wells, and one deep test well; well number 55-7. AMAX well 55-7 is likely the best known well in the region and is 7,001 feet deep. In 1988, Icerman and Parker  reported on the numerous proprietary geothermal studies done in the area, including the AMAX study. The 1986 Lightning Dock Geothermal Inc. acquisition of the lease previously held by AMAX, however, has made their previously proprietary data publically available. The AMAX study also included water chemistry work which confirmed the reservoir temperature estimates of approximately 170⁰C . Two temperature gradient holes were drilled through lakebed sediments in the eastern half of the KGRA to try and find the boundary of the geothermal resource. Hole TG 56-14 was drilled four kilometers (km) south west of the geothermal anomaly to a depth of 381 meters (m) with a measured gradient of 80°C/km. The depth to the 150⁰C isotherm at the TG 56-14 site was estimated to be 1.2 km. Hole TG 12-7 was drilled one km west of the anomaly to a depth of 305 m and the gradient was determined to be 120°/km. The depth to the 150⁰C isotherm at the TG 12-7 site was estimated to be 760 m .
In addition to the two temperature gradient holes, Cuniff and Bowers reported on fifty line miles of seismic traverses, sixty miles of older vibroseis data, 2,000 line-km of aeromagnetic data, two E-W electrical resistivity profiles and data from 304 gravity stations. Much of this data was collected in 2001 during the Geothermal Resource Evaluation and Definition (GRED) Program administered by DOE-AAO under Cooperative Agreement Number DE-FC07-00AL66977 . CO2 studies were accomplished by graduate students from New Mexico Tech University to search for surface leakage of CO2 along traces of subsurface faults. The results of the CO2 survey suggested that the thermal plume of the anomaly extends at depth to the south west , . Thermal Ion Dispersion (TID) is a metals exploration method that was applied to the Lightning Dock area in 2002 to determine if it was a feasible technique for identifying the extent of the thermal anomaly. The results not only delineated the anomaly well, but also showed zonation outward from the hottest area, suggesting fluid flow pathways . In 2005, Cuniff and Bowers  reported on the rest of the work completed under the GRED program, which ended in 2004. GRED temperature gradient hole TG36-7 was drilled to a depth of 305 meters, but eventually sold to D. Burgett. TG52-7 is a deep test hole completed in November 2003 with a final depth of 770 m. Numerous flow tests and temperature tests were conducted during and after the completion of well TG52-7 and a final BHT of 137⁰C was reported, with slightly higher temperatures at shallower depths. Cyrq Energy completed a magneto-telluric survey in 2010 and a 3-D seismic survey in 2012, but they have not made their results publicly available . "The earliest reports of water wells in the area were made by Schwennesen in 1918 '"`UNIQ--ref-0000003D-QINU`"', and then again in 1957 by Reeder'"`UNIQ--ref-0000003E-QINU`"', who discusses the effects of well pumping on the water table. The earliest reports of high temperature wells, however, comes in 1956 when Kintzinger'"`UNIQ--ref-0000003F-QINU`"' writes about the shallow irrigation wells that produced boiling water. Since that time many wells have been drilled to study the thermal anomaly at Lightning Dock. From 1975 to 1976, AMAX drilled fifty-three shallow temperature gradient holes that reached 45m to 158.5m in depth. In 1980, AMAX drilled four moderate depth holes that were from 275 to 305 m deep, and in 1984 a deep well called AMAX 55-7 was drilled to a TD of 2134 m feet and plugged back to 330 m. The data on the AMAX wells were originally proprietary, but were made available when Lighting Dock Geothermal Inc. purchased the lease from AMAX. Other wells drilled at the same time, by other companies, exist in the area but remain proprietary '"`UNIQ--ref-00000040-QINU`"'. AMAX 55-7, also sometimes called Steam Reserve Federal 55-7 or TFD 55-7, is 2134 m feet deep and located in Sec. 7, Twp. 25S, Rng. 19W '"`UNIQ--ref-00000041-QINU`"''"`UNIQ--ref-00000042-QINU`"''"`UNIQ--ref-00000043-QINU`"'. Dellechaie reported on six shallow wells drilled in T25S, R19W. Two of the wells encountered 101⁰C water at depths less than 20m '"`UNIQ--ref-00000044-QINU`"'. The Burgett Discovery Well, also called the Rosette 1 well, is 440 feet deep and the Burgett Greenhouse No. 2 well is also 440 feet deep. Both wells are located slightly north east of well 55-7. The McCants well No. 1 is located just east of the Burgett wells, and is 180 feet deep. Slightly south west of Rosette 1 are the Americulture wells AM-1 and AM-2 '"`UNIQ--ref-00000045-QINU`"'. AM-2 was revisited during the GRED project and made wider and deeper, down to a depth of 2100 feet in September of 2003 '"`UNIQ--ref-00000046-QINU`"'. Cockerel 1 is a deep well, drilled to 7404 feet. It was drilled outside (north of) the anomaly in Sec. 31, Twp. 24S, Rng. 19W '"`UNIQ--ref-00000047-QINU`"'. In 2010, Cyrq Energy re-entered well 55-7 and drilled it out to 2349 feet and then drilled well 45-7 to 2900 feet in 2011. Cyrq continued drilling in 2012 and completed wells 53-7 (4441 feet), 47-7 (3623 feet) and 63- (2400 feet). Cyrq Energy is now producing electrical power and injects into the production horizon'"`UNIQ--ref-00000048-QINU`"'. [[File:Figure2_WellFieldMap.jpg|thumb|500px|left|Figure 2 -- Well field map from the NREL Geothermal Prospector website'"`UNIQ--ref-00000049-QINU`"'." cannot be used as a page name in this wiki. The earliest reports of water wells in the area were made by Schwennesen in 1918 , and then again in 1957 by Reeder, who discusses the effects of well pumping on the water table. The earliest reports of high temperature wells, however, comes in 1956 when Kintzinger writes about the shallow irrigation wells that produced boiling water. Since that time many wells have been drilled to study the thermal anomaly at Lightning Dock. From 1975 to 1976, AMAX drilled fifty-three shallow temperature gradient holes that reached 45m to 158.5m in depth. In 1980, AMAX drilled four moderate depth holes that were from 275 to 305 m deep, and in 1984 a deep well called AMAX 55-7 was drilled to a TD of 2134 m feet and plugged back to 330 m. The data on the AMAX wells were originally proprietary, but were made available when Lighting Dock Geothermal Inc. purchased the lease from AMAX. Other wells drilled at the same time, by other companies, exist in the area but remain proprietary . AMAX 55-7, also sometimes called Steam Reserve Federal 55-7 or TFD 55-7, is 2134 m feet deep and located in Sec. 7, Twp. 25S, Rng. 19W . Dellechaie reported on six shallow wells drilled in T25S, R19W. Two of the wells encountered 101⁰C water at depths less than 20m . The Burgett Discovery Well, also called the Rosette 1 well, is 440 feet deep and the Burgett Greenhouse No. 2 well is also 440 feet deep. Both wells are located slightly north east of well 55-7. The McCants well No. 1 is located just east of the Burgett wells, and is 180 feet deep. Slightly south west of Rosette 1 are the Americulture wells AM-1 and AM-2 . AM-2 was revisited during the GRED project and made wider and deeper, down to a depth of 2100 feet in September of 2003 . Cockerel 1 is a deep well, drilled to 7404 feet. It was drilled outside (north of) the anomaly in Sec. 31, Twp. 24S, Rng. 19W . In 2010, Cyrq Energy re-entered well 55-7 and drilled it out to 2349 feet and then drilled well 45-7 to 2900 feet in 2011. Cyrq continued drilling in 2012 and completed wells 53-7 (4441 feet), 47-7 (3623 feet) and 63- (2400 feet). Cyrq Energy is now producing electrical power and injects into the production horizon. Figure 2 -- Well field map from the NREL Geothermal Prospector website. The US Department of Energy (DOE) has provided cost-share funding for two research and development projects at Lightning Dock. The Geothermal Resource Evaluation and Definition (GRED) Program, administered by DOE-AAO under Cooperative Agreement Number DE-FC07-00AL66977, funded research from 2001 to 2004 ; . The GRED study included geophysical and geochemical surveys, reflection seismic surveys, aeromagnetic surveys, gravity and electrical resistivity surveys, soil thermal ion and soil carbon dioxide flux surveys, four temperature gradient holes, and one deep exploratory well. Cuniff and Bowers also note that a small portion of the GRED project was funded through another DOE initiative, the DOE Cooperative Agreement DE-FC07-01ID14203 for the Enhanced Geothermal Systems Technology (EGS) Program. The EGS program paid for the completion of two intermediate depth temperature gradient holes . In 2004, the DOE provided cost-share funding to study power production capabilities at the AmeriCulture aquaculture facility. It was determined that a 1.42MW gross, 1 MW net, power plant was feasible . Drilling in the Lightning Dock KGRA has often been problematic due to the welded volcanic tuff layers . Pressurized, boiling water has caused problems both during drilling and during measurements . In most cases these problems only caused delays; however, in a few cases the pressurized water caused the abandonment of the drilling project ). Equipment sensitivity and data recording problems, coupled with problems controlling flow during testing at the TG52-7 well, were experienced with the GRED project . The AM-2 borehole was deepened during phase two of the GRED project, during which many problems were encountered. The drilling rods twisted off inside the bore hole numerous times and the well liner slipped in August 2003 while they were trying to remove 1,687 feet of drill rods, leaving 508 feet of equipment stuck in the hole. Progress was delayed over a month as they recovered the lining and the equipment from the borehole . The Lightning Dock geothermal area is located in the Animas Valley which ranges in a width from 11 to 21 km and has a length of about 145 km. The geothermal area lies at the foot of the Pyramid Mountains which border the Animas Valley in the east. North trending Basin and Range features and a caldera ring fracture zone are the primary structures of the area. Lightning Dock currently houses the largest geothermal greenhouse complex in the United States, one of the largest aquaculture farms, and a binary geothermal power plant that uses the geothermal water at 107°C to produce more than 500 kW which is consumed on site for the greenhouse and facility operations. With the addition of Cyrq Energy’s (formerly Raser Techonologies) 10MW geothermal power plant in 2014, it will be the most utilized geothermal resource in New Mexico. Three major regional tectonic features enclose the Lightning Dock geothermal system: a mid-Tertiary caldera ring fracture zone, a major basement structure zone, and a young incipient normal fault tip. The upflow zone is believed to be due to the intrusion of the mid-Tertiary caldera ring fracture in the horst block of the normal fault system. Here large volumes of water move up into a mixing zone where it’s postulated that water at 250°C mixes with the cold ground water in one to three ratios to produce mixed water at 150–170°C. The Riedel shear zone structurally controls the rise of this mixed water towards the aquifer located near the surface. All currently producing geothermal wells at Lightning Dock area are between 107 to 183 m deep and produce from the shallow outflow plume reservoir. Well production ranges from a few hundred gpm to 1,200 gpm (76 liters/s), typically at 99 to 113°C. The Lightning Dock KGRA is located in the Animas Valley in Southwestern New Mexico, Sec. 6 and 7, Twp. 25S, Rng. 19W, which is considered to be part of the Mexican Highland section of the Basin and Range physiographic province . The entire area is west of the Florida Mountains , and is a structural graben contained within the area between the Peloncillo Mountains to the west, and the Pyramid Mountains to the East . Icerman and Parker (1988)  also categorized the area as being of the Southern Rio-Grande Rift Province. The geothermal anomaly itself is located on the west wall of the Muir Cauldron in the southern Pyramid Mountains . The Animas Valley was created during the Laramide Orogeny approximately seventy-five million years ago as part of the mid-to-late Tertiary Basin and Range event . It is approximately eighteen kilometers wide and twenty-five kilometers long, oriented north to south and bounded on the east and west with normal faults associated with east-west tensional forces . There are two Playa lakes in the area, which are remnants of the large, shallow Lake Animas which was present during the Pleistocene Epoch . Volcanism in the area includes the Muir Cauldron, which is part of the geothermal system as an inferred, Tertiary age caldera ring fracture . Also present are andesitic volcanics associated with Laramide events, which include more recent Pre-oligocene eruption events and small cinder cones approximately 140,000 years old . “Pre cauldron” rock exposures include the sedimentary Pennsylvanian Horquilla Formation and Cretaceous U-Bar Formation, as well as basalts and andesites from the late Cretaceous, Tertiary, and Oligocene  I. Compressional deformation occurred during both the Precambrian and the Laramide, the latter of which has significant andesitic volcanism associated with it . During the Cambro-Ordovician time period, the region also saw significant uplift and extensional folding and faulting from the Basin and Range province . Sediments from the Upper Paleozoic and Mesozoic thicken to the southwest into the Pedregosa Basin . The Tertiary rocks local to the Lightning Dock area overlie the Mississippian Escabrosa Formation instead of Pennsylvanian rocks, indicating a Laramide inversion . “Post cauldron” formations include rocks from the Oligocene (Montoya and El Paso Formations) to the present, and include early Miocene ash, flow tuffs, and the rim rock mountain group  The exposed geology in the area is primarily Cenozoic, especially in the Northeast portion of the valley . The main rock cover is the Gila conglomerate, which consists of Miocene aged alluvium from uplifted fault blocks and overlies Tertiary aged rocks . The Gila Conglomerate was mistakenly identified as Rhyolite by Kintzinger (1956) , and continued to be referred to as such until identified as highly silicified Gila Conglomerate by Witcher (2006) . The structure of the Lightning Dock KGRA geothermal anomaly is controlled by the north-south trending Animas Fault, which has a 500 meter displacement, and by the Muir Cauldron, which formed in the mid-Tertiary and intersects with the Animas Fault . The Animas fault ends at the northern boundary of the Lightning Dock anomaly, and may have enhanced the local fracture permeability . In addition to the controlling structure, an ancient geothermal system may be present. Table Top Mountain, a hydrothermally silicified Gila Conglomerate outcrop, is directly south of the geothermal anomaly. The structure of the outcrop has roughly the same dimensions as the 800-1000 mW/m2 heat flow contour as mapped by Witcher (2006) . Structures, such as those created by folding and uplift, that formed before Basin and Range extensional faulting include compressional deformations that occurred in the Precambrian, Paleozoic, Laramide, and late-to mid-Tertiary rocks . In addition, regional uplift caused by Cambro-Ordovician plutonism and wrech faulting associated with the Laramide orogeny may have occurred . In the middle to late Tertiary, both large scale volcanism, and basin and range extensional faulting began, creating the north-trending horsts and grabens that make up the basins and ranges present today . Deformations that have occurred since the extensional event include regional wedging out of units, and unconformities in the Butto-Florida uplift . "The Lightning Dock geothermal anomaly exists within the closed basin system of the Animas Valley '"`UNIQ--ref-00000092-QINU`"'. The reservoir is in primarily rhyolitic welded tuff, and is 2.5 km long from north to south, and 1.5 km wide from east to west '"`UNIQ--ref-00000093-QINU`"''"`UNIQ--ref-00000094-QINU`"'. The reservoir depth is 25 meters on the north end of the anomaly, and 200 meters at the south end, with a volume of 0.66 km3 '"`UNIQ--ref-00000095-QINU`"'. Elston et al. (1983) '"`UNIQ--ref-00000096-QINU`"' used these parameters to assess the geothermal resource at 2.1 x 1017 Joules of thermal energy in place; however, the resource was estimated to have a volume of 3.3 km3 and thermal energy in place of 1.6 x 1018 Joules by Brook et al. (1978) '"`UNIQ--ref-00000097-QINU`"'. Even though the resource had been utilized for nearly thirty years at the time of publication, Schochet and Cuniff (2001) '"`UNIQ--ref-00000098-QINU`"' found that the shallow geothermal system had not suffered permanent drawdown. Several wells have been analyzed to determine the extent of the reservoirs, primarily at the northeast end of the deep fault zone '"`UNIQ--ref-00000099-QINU`"'. Smith (1978) '"`UNIQ--ref-0000009A-QINU`"' and Brook (1978) '"`UNIQ--ref-0000009B-QINU`"' both encountered temperatures around 100°C at a depth of approximately 30 meters. Icerman and Parker (1988) '"`UNIQ--ref-0000009C-QINU`"' drilled a well that intersected the Animas Valley Fault and obtained temperature measurements of 165°C at approximately two kilometers. Schochet and Cuniff determined in 2001 '"`UNIQ--ref-0000009D-QINU`"' that there are two relatively shallow conventional reservoirs of moderate temperature at 1200 and 3300 feet depths, as well as an EGS type reservoir at the 3000 to 4000 foot range that may yield as much as 25-50 MW. Gravity and magnetics surveys have been used to characterize the resource area and identify faults and intrusive rock bodies which affect the hydrothermal system '"`UNIQ--ref-000000A1-QINU`"''"`UNIQ--ref-000000A2-QINU`"'. Swanberg used over 500 gravity and magnetics measurements and found that the hot wells were at the intersection of two faults. He also identified a dipping, north-south trending dyke which affects water movements within the anomaly. Swanberg conducted resisitivity surveys and found the dyke to be a resistivity high, which is unusual since resistivity lows are usually associated with geothermal fluids. Swanberg also found that the dyke is too shallow to be a heat source since it is mid to late Tertiary and that those depths it would have cooled long ago. He determined that like the other local intrusive bodies, the dyke may be related to the Muir Cauldron '"`UNIQ--ref-000000A3-QINU`"'. O’Brian and Stone (1984) '"`UNIQ--ref-000000A4-QINU`"' used bouger anomaly maps, seismic refraction profiles, surficial geology, tectonic features, geological and geophysical well logs and driller’s logs to study the Animas Valley. They mapped the relationship between gravity data and transmissivity data and use it to approximate transmissivity data where none existed. They evaluated the water flow in an area of 457 sqaure miles, covering the lower Animas Valley. They used water data from before 1948 since water extraction increased dramatically starting in 1948. To verify their model they then simulated the drawdown due to pumping from 1948 to 1981. The results of their modeling placed drawdown contour lines within 18 feet of observed drawdown lines, indicating their model was successful '"`UNIQ--ref-000000A5-QINU`"'. Johnson and Rappuhn (2002) '"`UNIQ--ref-000000A8-QINU`"' modeled ground water flow and recharge in the Lower Animas Basin and the Lordsburg Basin and stated that recharge to the basin-fill aquifer in the lightning Dock KGRA may be from geothermal fluids which are heated at depth and then rise along faults and fractures associated with the Animas Valley fault zone and the outer ring-fracture of the Muir Cauldron. The rate of the upward flow was not estimated in their study, however. Thus, despite being useful for predicting the effects of ground-water pumping for most of their study area, their model does not provide estimated results of geothermal well production in the Lightning Dock KGRA '"`UNIQ--ref-000000A9-QINU`"'." cannot be used as a page name in this wiki. The Lightning Dock geothermal anomaly exists within the closed basin system of the Animas Valley . The reservoir is in primarily rhyolitic welded tuff, and is 2.5 km long from north to south, and 1.5 km wide from east to west . The reservoir depth is 25 meters on the north end of the anomaly, and 200 meters at the south end, with a volume of 0.66 km3 . Elston et al. (1983)  used these parameters to assess the geothermal resource at 2.1 x 1017 Joules of thermal energy in place; however, the resource was estimated to have a volume of 3.3 km3 and thermal energy in place of 1.6 x 1018 Joules by Brook et al. (1978) . Even though the resource had been utilized for nearly thirty years at the time of publication, Schochet and Cuniff (2001)  found that the shallow geothermal system had not suffered permanent drawdown. Several wells have been analyzed to determine the extent of the reservoirs, primarily at the northeast end of the deep fault zone . Smith (1978)  and Brook (1978)  both encountered temperatures around 100°C at a depth of approximately 30 meters. Icerman and Parker (1988)  drilled a well that intersected the Animas Valley Fault and obtained temperature measurements of 165°C at approximately two kilometers. Schochet and Cuniff determined in 2001  that there are two relatively shallow conventional reservoirs of moderate temperature at 1200 and 3300 feet depths, as well as an EGS type reservoir at the 3000 to 4000 foot range that may yield as much as 25-50 MW. Gravity and magnetics surveys have been used to characterize the resource area and identify faults and intrusive rock bodies which affect the hydrothermal system . Swanberg used over 500 gravity and magnetics measurements and found that the hot wells were at the intersection of two faults. He also identified a dipping, north-south trending dyke which affects water movements within the anomaly. Swanberg conducted resisitivity surveys and found the dyke to be a resistivity high, which is unusual since resistivity lows are usually associated with geothermal fluids. Swanberg also found that the dyke is too shallow to be a heat source since it is mid to late Tertiary and that those depths it would have cooled long ago. He determined that like the other local intrusive bodies, the dyke may be related to the Muir Cauldron . O’Brian and Stone (1984)  used bouger anomaly maps, seismic refraction profiles, surficial geology, tectonic features, geological and geophysical well logs and driller’s logs to study the Animas Valley. They mapped the relationship between gravity data and transmissivity data and use it to approximate transmissivity data where none existed. They evaluated the water flow in an area of 457 sqaure miles, covering the lower Animas Valley. They used water data from before 1948 since water extraction increased dramatically starting in 1948. To verify their model they then simulated the drawdown due to pumping from 1948 to 1981. The results of their modeling placed drawdown contour lines within 18 feet of observed drawdown lines, indicating their model was successful . Johnson and Rappuhn (2002)  modeled ground water flow and recharge in the Lower Animas Basin and the Lordsburg Basin and stated that recharge to the basin-fill aquifer in the lightning Dock KGRA may be from geothermal fluids which are heated at depth and then rise along faults and fractures associated with the Animas Valley fault zone and the outer ring-fracture of the Muir Cauldron. The rate of the upward flow was not estimated in their study, however. Thus, despite being useful for predicting the effects of ground-water pumping for most of their study area, their model does not provide estimated results of geothermal well production in the Lightning Dock KGRA . "No consensus has been reached concerning the heat source for the Lightning Dock Geothermal Anomaly. Johnson and Rappuhn (2002) '"`UNIQ--ref-000000AA-QINU`"' believed the heat source to be a basaltic magma body at depth; however, Schochet and Cunniff (2001) '"`UNIQ--ref-000000AB-QINU`"' wrote that there was no geophysical, geochemical, or geological evidence of magma-heated waters even though the geochemical data was consistent with deep circulation and findings of 250°C water at depths of 6-8 kilometers. The existence of the thermally controlled structure is heavily debated as well. It is well reported that the geothermal anomaly is controlled by the Animas Fault intersecting the Muir Cauldron '"`UNIQ--ref-000000AC-QINU`"''"`UNIQ--ref-000000AD-QINU`"''"`UNIQ--ref-000000AE-QINU`"''"`UNIQ--ref-000000AF-QINU`"''"`UNIQ--ref-000000B0-QINU`"'. However, a proprietary report by Blackwell et al. (2001) shows disagreement, and suggests an uplifted horst block, thus it has been determined that further research is necessary." cannot be used as a page name in this wiki. No consensus has been reached concerning the heat source for the Lightning Dock Geothermal Anomaly. Johnson and Rappuhn (2002)  believed the heat source to be a basaltic magma body at depth; however, Schochet and Cunniff (2001)  wrote that there was no geophysical, geochemical, or geological evidence of magma-heated waters even though the geochemical data was consistent with deep circulation and findings of 250°C water at depths of 6-8 kilometers. The existence of the thermally controlled structure is heavily debated as well. It is well reported that the geothermal anomaly is controlled by the Animas Fault intersecting the Muir Cauldron . However, a proprietary report by Blackwell et al. (2001) shows disagreement, and suggests an uplifted horst block, thus it has been determined that further research is necessary. The four wells drilled in 1948 produced water with 1100 mg/L TDS and 13 mg/L fluoride . In 1977, Dellechaie  reported on a suite of volcanic minerals and carbonates present in the water from two hot wells. The water contained 1200 mg/l of total dissolved solids (TDS) with low concentrations of lithium, beryllium and silica concentrations that did not exceed 145 mg/l. Geothermometry suggested subsurface temperatures of approximately 160⁰C . A sample of thermal water was tested for radioactivity, but found to be more similar to the nearby non-thermal waters than expected. Only 0.2 ppb uranium and 0.3 ppb radium were detected . Quartz geothermometers were used on other wells and estimates indicated a mean reservoir temperature of 144 ± 13⁰C . Elston et al. (1983)  reported results of isotope analysis from fifty-five water samples. The analysis determined that most of the shallow ground water recharge is from winter precipitation, not summer rains. The thermal waters, on the other hand, were isotopically depleted relative to the shallow ground waters, and three possible explanations were proposed: 1) The deep reservoir contained ancient trapped meteoric water, from 5,000 to 50,000 years ago, due to slow, deep circulation. 2) The waters may represent ground water recharge from a climate with relatively more winter precipitation, such as was likely present approximately 8,000 years ago. 3) The waters may be from a condensed-vapor phase on the edge of a boiling geothermal system since below 220⁰C water vapor is depleted in both D and 18O relative to liquid water . Thermal ion dispersion (TID) determines the movement of hot, mineral bearing waters through rock and soil. The method is usually used in metals exploration, but was applied to the Lightning Dock KGRA to determine if the technique could detect the thermal anomaly and if any specific geothermal features could be detected. A total of seventy-seven soil samples were analyzed and the results showed not only the outline of the anomaly, but also zonation of the mineral assemblages which indicated flow paths . Geochemical analysis was also performed on four thermal water samples, taken from different parts of the geothermal anomaly. Analysis of dissolved ions included Na, Ca, Mg, Sr, K, HCO3, SO4, Cl, SiO2, Br, Li, B and F as well as TDS. The samples were also analyzed for oxygen, carbon, sulfur and strontium isotope ratios. Data interpretation focused on flow paths, sources, mixing, subsurface boiling, and geothermometry. The results showed the water from AM-1 was likely an end-member geothermal water with small amounts of non-thermal water mixed with the thermal water in the other sites, with the most mixing found at AM-4. Sites AM-2 and AM-3 show mixing from different non-thermal water sources, which when combined with gravity data suggests a subsurface barrier is present between the two sites. The silica concentration data suggests non-equilibrium mixing took place below 150⁰C . ↑ Samir Dahal, Mark R. McDonald, Bailey Bubach, and Anna M. Crowell. 2012. Evaluation of geothermal potential of Lightning Dock KGRA, New Mexico. GRC Transactions. 36(1):637-640. ↑ W. E. Elston, E. G. Deal, M. J. Logsdon (New Mexico Bureau of Mines and Mineral). 1983. 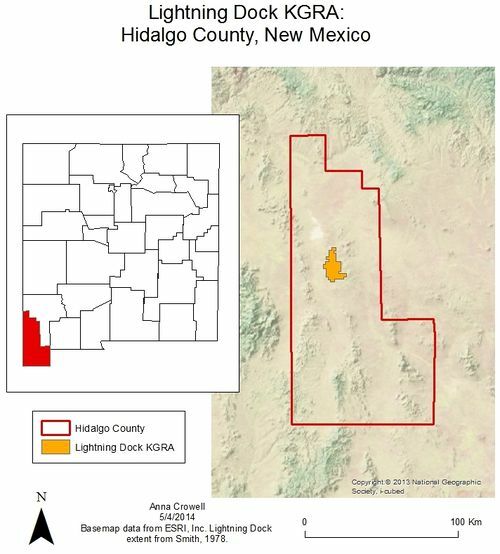 Geology and geothermal waters of Lightning Dock region, Animas Valley and Pyramid Mountains, Hidalgo County, New Mexico.. 177 Edition. .: New Mexico Bureau of Mines and Mineral Resources.. Report No. : 44. ↑ 4.0 4.1 4.2 U.S. Geological Survey. 2008. Assessment of Moderate- and High-Temperature Geothermal Resources of the United States. USA: U.S. Geological Survey. Report No. : Fact Sheet 2008-3082. ↑ 5.00 5.01 5.02 5.03 5.04 5.05 5.06 5.07 5.08 5.09 5.10 5.11 5.12 5.13 5.14 Stephen Parker, L. Icerman (United States Department of Energy). 1988. New Mexico Statewide Geothermal Energy Program. New Mexico: New Mexico Research and Development Institute. ↑ 6.0 6.1 6.2 6.3 6.4 6.5 6.6 6.7 P. R. Kintzinger. 1956. Geothermal Survey of Hot Ground Near Lordsburg, New Mexico. Science, New Series. 124(3223):629-630. ↑ 7.00 7.01 7.02 7.03 7.04 7.05 7.06 7.07 7.08 7.09 7.10 7.11 7.12 7.13 7.14 7.15 7.16 7.17 7.18 7.19 7.20 7.21 W. E. Elston, E. G. Deal, M. J. Logsdon. 1983. Geology and geothermal waters of Lightning Dock region, Animas Valley and Pyramid Mountains, Hidalgo County, New Mexico. New Mexico Bureau of Mines and Mineral Resources. 177:44. ↑ P.R. Grant. 1978. Geothermal Energy Resources of Northwest New Mexico. Four Corners Geological Society. I-II:8. ↑ 10.0 10.1 10.2 10.3 10.4 10.5 D.J. Fleischman. 2006. Geothermal Resource Development Needs in New Mexico. (!) : Geothermal Energy Association. ↑ 11.0 11.1 J. C. Witcher, J. W. Lund, D. E. Seawright. 2002. Lightning Dock KGRA, New Mexico's Largest Geothermal Greenhouse, Largest Aquaculture Facility, and First Binary Electrical Power Plant. Geo-Heat Center Bulletin. 23:37-41. ↑ 12.00 12.01 12.02 12.03 12.04 12.05 12.06 12.07 12.08 12.09 12.10 12.11 12.12 12.13 S. Dahal, M. R. McDonald, B. Bubach, A. M. Crowell. 2012. Evaluation of Geothermal Potential of Lightning Dock KGRA, New Mexico. Geothermal Resources Council. 36:637-640. ↑ 13.0 13.1 13.2 13.3 13.4 13.5 13.6 M.S. Johnson, D.H. Rappuhn. 2002. Hydrogeology and Preliminary Simulation of Ground-water Flow in the Lower Animas and Lordsburg Basins: Grant and Hidalgo Counties, New Mexico. (!) : New Mexico Office of the State Engineer Technical Division. Report No. : Hydrology Report 02-06. ↑ 15.0 15.1 15.2 15.3 15.4 D.N. Schochet, R.A. Cunniff. 2001. Development of a plan to implement enhanced geothermal system (EGS) in the animas valley, New Mexico. (!) : ORMAT International, Inc. and Lightning Dock Geothermal, Inc..
↑ B. C. Farhar. 2002. Geothermal Access to Federal and Tribal Lands: A Progress Report. Transactions of the Geothermal Resources Council. 26:611-615. ↑ 18.00 18.01 18.02 18.03 18.04 18.05 18.06 18.07 18.08 18.09 18.10 18.11 18.12 18.13 18.14 R.A. Cunniff, R.L. Bowers. 2003. Final Report: Enhanced Geothermal Systems Technology Phase II: Animas Valley, New Mexico. (!) : Lightning Dock Geothermal, Inc. Technical Report. ↑ 19.0 19.1 19.2 19.3 A. T. Schwennesen. 1918. Ground Water in the Animas, Playas, Hachita, and San Luis Basins, New Mexico. Washington: Government Printing Office. Report No. : Water-Supply Paper 422. ↑ 20.0 20.1 20.2 20.3 20.4 20.5 F. Dellechaie. 1977. A Geological and Hydro-Geochemical Study of the Animas Geothermal Area, Hidalgo County, New Mexico. Geothermal: State of the Art. 1:73-75. ↑ 21.0 21.1 21.2 21.3 Swanberg. 1976. Geothermal Studies in Southwest New Mexico. New Mexico Energy Institute: New Mexico Energy Research and Development Program. ↑ Arnold, Anderson, Donaldson, Foster, Gutjahr, Hatton, Hill, Martinez (New Mexico Bureau of Mines and Mineral Resources). 1978. New Mexico’s Energy Resources ’77: Office of the State Geologist. Socorro, New Mexico: New Mexico Bureau of Mines and Mineral Resources. ↑ 23.0 23.1 23.2 23.3 H. O. Reeder. 1957. Ground water in Animas Valley, Hidalgo County, New Mexico. (!) : New Mexico State Engineer's Office. Report No. : Technical Report 11. ↑ 24.00 24.01 24.02 24.03 24.04 24.05 24.06 24.07 24.08 24.09 24.10 J. C. Witcher. 2006. GRED Studies and Drilling of Americulture State 2, Americulture Tilapia Farm: Lightning Dock KGRA, Las Animas Valley, New Mexico. (!) : Americulture. ↑ 26.0 26.1 26.2 26.3 Roy A. Cunniff, Roger L. Bowers (DOE). 2005. Final technical report geothermal resource evaluation and definition (GRED) Program - Phase I, II and III for the Animas Valley, NM Geothermal Resource: special proprietary report to Lightning Dock Geothermal, Inc.. DOE: Lightning Dock Geothermal, Inc. Technical Report. ↑ 28.0 28.1 28.2 28.3 28.4 O'Brien, K. M., & Stone, W. J.. 1984. Role of Geological and Geophysical Data in Modeling a Southwestern Alluvial Basin. Ground Water. 22:717-727. ↑ Z. Spiegel. 1957. Geology: Ground water in Animas Valley, Hidalgo County, New Mexico. Santa Fe, New Mexico: New Mexico State Engineer's Office. Report No. : Technical Report 11. ↑ 31.0 31.1 31.2 31.3 Brook, Mariner, Mabey, Swanson, Guffanti, Muffler. 1978. Hydrothermal Convection Systems with Reservoir Temperatures greater than or equal to 90 degrees C. Assessment of Geothermal Resources of the United States -- 1978, Geological Survey Circular. Circular 790:18-85. ↑ W. H. Summers. 1976. Catalog of thermal waters in New Mexico. Online: New Mexico Bureau of Mines & Mineral Resources. Report No. : Hydrologic Report no. 4. This page was last modified on 27 October 2015, at 14:43.